When our founders were shopping for their bridal wardrobes, they couldn’t believe how difficult it was to find all the information they needed to make informed decisions on which bridal boutiques they should visit. There are so many, each offering something different so it’s important you take the time to research and select the ones which are the best fit for you. There’s nothing more discouraging than attending a bridal appointment and realising they don’t cater for the look you want, or don’t have anything that works within your budget. You’ll find our founders’ recommendations for Multi-Brand Boutiques where you’ll find an edit of designers to try; Own Brand Bridal Boutiques which sell just one designer; and Bespoke Bridal Brands for brides who want to create a custom piece. Take note! Getting an appointment to fit your schedule can often be difficult so as soon as you come across a bridal boutique you want to visit, get in touch. If you found them through White Dossier, please do let them know. At the moment, our bridal boutique recommendations are only in the UK. More destinations will be added soon. High-end designer brands Vera Wang, Elie Saab, Oscar de la Renta, J’Aton Bride and contemporary brands Hermione de Paula, Charlie Brear, Temperley London, Amanda Wakeley, Bo & Luca and Halfpenny London. The Wedding Gallery is the world’s first luxury wedding boutique for both shopping and wedding planning. Having opened in the Winter of 2018, the space is brand new and makes for the most luxurious bridal shopping experience in London. There’s a lovely cafe to relax in before, or after your wedding dress appointment, and as well as wedding dresses, you can browse a beautiful selection of jewellery, accessories, lingerie and menswear brands. The Wedding Gallery is also a home to the first salon dedicated to wedding beauty – health, wellness, hair and make-up. The Wedding Gallery has a great curation of bridal brands, selected to suit all styles and budgets and it is the perfect destination to enjoy an in-person consultation with our Bridal Concierge. An introductory appointment with us is £70, for up to 90 minutes, during which we’ll expertly guide you to find “the” dress. Following on from that, the cost of White Dossier’s services will be dependent on your needs and charged for by the hour. Costs are always shared and agreed on upfront. The Wedding Gallery has a carefully curated selection of wedding brands, helping you find everything that you need to plan your perfect day. From stationers to florists, photographers to caterers, this is a one-stop wedding destination featuring a large selection of the best names in the industry. The Wedding Gallery has a broad range of brands, with very different price tags. At the higher end are designer brands Elie Saab, J’Aton Bride and Oscar de la Renta (£7,000 – £35,000) and at the lower end are contemporary designers such as Bo & Luca and Halfpenny London (£2,000 – £5,000). For designer dresses without the price tag, the Wedding Gallery is the exclusive stockist for Brides Do Good. Two-thirds of the sales from their pre-loved and sample designer gowns is donated to their partner charity working to eradicate child marriage. For anyone planning a wedding, we would also advise you to book in for a Consultancy appointment which lasts 75 minutes and is £50. This is a perfect opportunity to receive advice from an experienced wedding planner, no matter what stage you are at in planning your wedding. If, however, you want to come and try wedding dresses on, you need to book a women’s fashion appointment, which allows you to come with 2 additional guests, lasts an hour and is £30. Or for a highly personalised styling experience with White Dossier’s Bridal Concierge, an appointment is £70 for up to 90 minutes. You can also book a complimentary appointment which allows you to browse what’s on offer but not try anything on. Effortlessly beautiful bridal wear, with a selection of French designers that sit at the forefront of bohemian bridal fashion. All of them! The Mews are the exclusive UK stockist of sought after Parisian designers Rime Arodaky, Laure de Sagazan, Donatelle Godart, Margaux Tardits, and Jeanne Source. Run by a mother and daughter duo and loved by brides for their cool stylists who expertly guide you through the trying on process. Trust them and try on a few pieces they suggest even if you don’t think they’re you – these girls know their stuff. £1500 – £5000. Excluding alteration fees. £20, refundable within 48 hours of cancelling. Return appointments are not charged for. They’re the UK’s exclusive stockist of Zuhair Murad and Naeem Khan but also stock Berta Bridal, Monique Lhuillier Bliss, Caroline Herrera, Costarellos, Georges Hobika, Houghton, Marco & Maria, Rue de Seine, Savannah Miller and Yolan Cris. Their Knightsbridge boutique has the largest selection of White Dossier approved high fashion bridal designers in the U.K. For those of you not after a look with a couture piece tag, their South Kensington branch has some designer’s less expensive second lines and equally covetable brands with smaller price tags. There’s a broad selection of brands available at The Wedding Club, each with their own signature style and price range. Because of their extensive offer, it’s a great first wedding dress shop to visit giving you the opportunity to try on a diverse range of styles from different designers and decide on the direction you want your bridal look to go in and the kind of styles you want to look into further. This boutique often has Trunk Shows. Make sure you sign up to White Dossier’s Emails to stay in the know and get the opportunity to try dresses by designers you can’t usually find in London. When a show is announced you need to be quick as their spots fill up fast. Their Knightsbridge boutique has their most exclusive and expensive designers (£7,000 – £30,000) while their South Kensington and Birmingham boutiques have their more contemporary brands (£2,000 – £7,000). If you’re going with a particular designer in mind to try, make sure the boutique you visit stocks it. Morgan Davies remain the exclusive UK stockist for Israeli designer Inbal Dror. The designer’s lace bodycon fit and flare, corset back and mega train became her signature and has since been imitated by many designer brands. For timeless elegance with a surprisingly good price tag, Jesus Piero and Rosa Clara are both names to know. 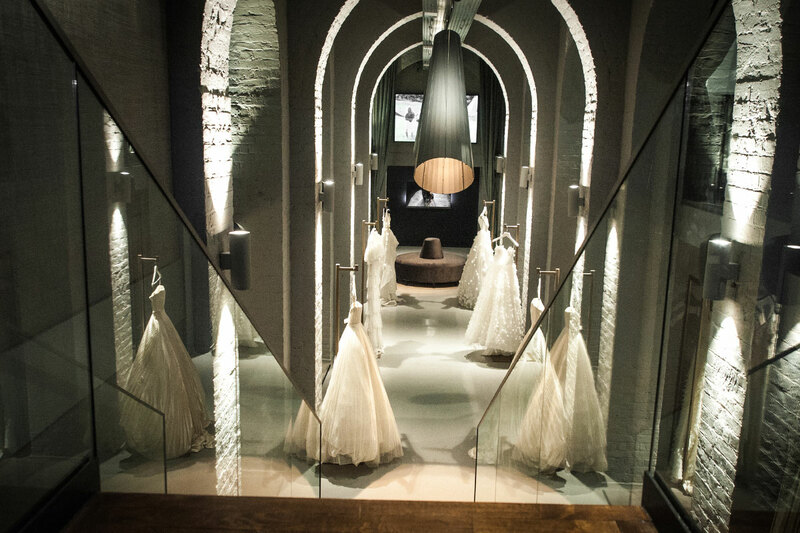 If you want to try on an Inbal Dror, this is the only place you can. They also have a strong selection of other designers such as Lee Petra Greenabu who create similar fishtail dresses at a less expensive price point. Even if you don’t think you want something with a full skirt, try on a crisp, beautifully simple design from Rosa Clara or Jesus Piero just to see. As we have learnt from working with our brides, you just never know! As a guide, the prices in the Hitchin boutique are from £1200 to £3000, and in the London boutique from £1700 to £9000. Non-refundable £20 booking fee for Saturday appointments. Weekdays are free of charge. Since it opened in 2004, Browns Bride has been known for their selection of bridal’s most exclusive names. While a plethora of bridal boutiques have opened up since then, it still remains a bridal institution and they have a beautiful selection of designers you won’t find stocked anywhere else in the U.K. Going to Browns Bride is a rite of passage for many brides. With so many beautiful exclusive names to try, it feels indulgent. They have a broad range of designers, each with a very specific look and feel so it’s a great place to try on lots of different dresses to get an initial idea of what kind of dress you may want. While Browns Bride do stock dresses at the £3000 point, most of their dresses come in around £5000-£8000 with a lot of them going over this and right up to £17,000. In addition, Browns often has exclusive Trunk Shows. Make sure you sign up White Dossier’s Trunk Show Email to stay in the know and get the opportunity to try dresses by designers you can’t usually find in London. Around £3000 for Elizabeth Filmore and Viktor & Rolf, up to £17,000 for Galia Lahav and Peter Langner. Bridal Boutique: Canada Place, 34 North Colonnade, Canary Wharf, London, E14 5HX. Bridesmaid Boutique: 36 Beaufort Court, Admiral’s Way, Canary Wharf, London, E14 9XL. They’re the exclusive UK stockist for one of Israel’s most exciting bridal designers, Alon Livne. Les Trois Seours is an impressive boutique, albeit in a slightly out-of-the-way location for shopping. They stock a large range of designers but White Dossier only recommends visiting if you’re interested in one or more of the designers listed above. If you’re after a silky slip style, don’t miss Sarah Janks’ Goddess collection. Cut on the bias and with an Old Hollywood feel – they are stunning. The store also has a great curation of bridal accessories, also available online. Dresses start at around £2000 and go up to £7000. There is a £25 booking fee that is redeemable against any dress purchases. Situated in a re-furbished Victorian chapel, Miss Bush is the perfect backdrop for trying on wedding dresses. A family business that’s been going for 30 years, they really know how to spot a gem and make brides feel special. With their store staff, you know you’re in safe hands and for brides who are worried about their shape, Miss Bush are experts in shapewear and alterations so you’re guaranteed to leave with a dress that is the perfect fit for you. Miss Bush is one of the few UK boutiques selling cult New-York bridal label Houghton in the U.K. They also stock Yolan Cris who is one of our latest bridal crushes for boho brides. This is a store that’s not all about the most famous brands and the biggest ticket price and that’s what makes it special. Prices start at £1500 and go up to £6000. £35 for a weekend appointment, refundable against ainy purchase you make. The two friends (Jane and Mira) who own and run Mirror Mirror, trained at London College of Fashion and have been dressing brides for nearly 30 years. When you visit their lovely boutique, you can really feel the love they have for what they do. Mirror Mirror is one of the few London boutique s that stock Yolan Cris. If you’re interested in their boho styles, this boutique is definitely worth a visit. Their own collection is also lovely and always features style forward silhouettes, lovingly made with a very fair price tag. Mirror Mirror has a large collection of dresses so (if you plan on going to try Yolan Cris,) while you’re there, it’s a good opportunity to let their very experienced staff guide you through trying on various shapes so you can get an idea of what silhouettes you do and don’t like. Starting at £1500 and going up to £5000, although most dresses are at the £2500-£3000 mark. Anna Campbell, Daughters of SImone, Houghton, Rue de Seine, Truvelle. Jean Jackson Couture in Urmston and The Northern Quarter carry different labels. The Urmston boutique stocks designs by Rue De Seine, whilst the Northern Quarter studio is the exclusive stockist of Anna Campbell, Daughters of Simone and Houghton. The girls who run Jean Jackson couture stock some of the most exciting emerging names in bridal for those looking for something alternative. Jean Jackson couture have developed a reputation for themselves for having one of the most forward-thinking bridal wear selections in the UK. If most of the bridal designers you see just don’t appeal to you, this boutique should be top of your list to visit. If you’re heading to Manchester for your appointment, visit the Urmston boutique first and then head to the Northern Quarter, where after you’ve finished trying on wedding dresses, there are plenty of great independent boutiques, restaurant and bars. There is no charge for standard appointments mid-week, except for in school or public holidays, however there is £20 charge for standard Saturday appointments and standard evening appointments. Private group appointments are available and take place mid-week and last for up to 90 minutes. During this time, you’ll have the whole studio to yourself and are welcome to bring up to 5 guests. There is a £50 charge for private appointments. All costs are redeemable against full price purchases. From Ellie Saab to Yolan Cris, owner Gillian Million offers brides the most exclusive pre-loved designer wedding dress collection. The lovely and very knowlegable owner also has her own namesake bridal accessories collection and can make bespoke pieces from headdresses to veils. Gillian, the boutique ’s owner creates an amazing bespoke experience for her brides. She really takes the time to understand her brides and their vision and has an amazing knowledge of the brands and the dresses she has in stock. Trust Gillian and try on a few dresses that she suggests for you, even if they weren’t what you had in mind. She has an amazing instinct for what will work on you and what won’t. Designer wedding dresses at very affordable prices. Brides after a designer dress without the price tag, this is the shop for you. Appointments are complimentary. Just make sure you book in as the store gets busy and the owner likes to give each bride who visits some of her time. Boho brides, this gorgeous boutique in beautiful Hove is for you! Not only do they have some of the most interesting emerging names but the owner Leonie truly knows her stuff. Hove, only a couple of miles from central Brighton, is full of fabulous places. If you arrive early for your appointment we recommend Hove Patisserie a few doors up for a coffee and scrumptious cake or pastry. (Following your appointment, from the amazing seafood at the Urchin Pub to gourmet fine dining at Etch or cheese and wine at Cafe Malbec.) If the sun is shining it is well worth the 10-minute walk to the seafront and if you fancy making a full trip of it, we can recommend Drakes hotel for a little luxury or the Artists Residence for the hippy arty lovers. £20 appointment fee for a Saturday visit. This is returned in the form of a voucher, which can be redeemed against any product or service within 12 months. An icon of the uptown New York fashion scene, Oscar de la Renta once said his creations are beloved for their “beautiful ornamentation, details, fabrics and embroideries.” The brand is adored for its exquisite bridal wear, which is defined by an architectural, sophisticated, timeless elegance. As US Vogue.com put it: “For brides-to-be, an Oscar gown is the ultimate.” Now designed by the brand’s young co-creative directors Fernando Garcia and Laura Kim (who also own the brand Monse) the bridal collections have been given a younger, more fashion-forward spin. They are however still indisputably classic and very Oscar! Oscar de la Renta do not do bespoke bridal from their London store. Their in-house seamstresses can make small alterations/ additions however. This Australian brand is known for its effortless, mostly boho wedding gowns that are handmade from European laces and silks. When their London showroom opened in April 2017, brides looking for an untraditional, laid- back look (that was striking but wouldn’t break the bank) couldn’t believe their luck. Their dresses are both striking and affordable and their showroom is also super lovely (think dusty pinks and rose gold accents) and staffed by cool girls who will get your style. £750 – £2750. Most dresses are around £1500-£2000. Free up to an hour, where you can try on 5 of their dresses. They also offer a free, 45 minute appointment for accessories and bridesmaid dresses. This Italian brand uses only the most beautiful fabrics (think natural silk) and their collections have an airy, understated elegance. Don’t be put off by their styling which is a little dated! When you style the pieces in your own way, they will look totally different. Each piece is made to order in Milan and the brand is very happy for you to customise their designs and mix and match various styles to make your own. Their highly experienced staff guide you through this process seamlessly and we assure you, you’re in very safe hands. For price and quality, if you’re after understated romance, this is definitely an under-the-radar brand to consider. A consultation fee of £ 30.00 is charged when booking. However, appointments on Wednesday and Thursday are free of charge. For the brides who know exactly what they want, there are some amazing brands that do bespoke / custom bridal. You can tweak an existing style you’ve seen or work closely with a designer to achieve something you have envisioned. This option can often work out to be more expensive than buying an existing style (even if made to measure), but this may be the only way to get the bridal look you’ve truly dreamed of. If custom is something you are considering, read our Practical Advice Feature for more insight from us on this. Sculptural and feminine are two words often used to describe Emilia Wickstead’s modern formal wear. Her custom bridal offer is unrivaled if you’re after a modern, sculptural piece as her cut and craftsmanship are phenomenal. We guarantee you will have seen one of her bespoke wedding dresses come up on your Instagram feed and fallen in love with it. Emilia Wickstead offers several options when it comes to bridal. The first option they offer is a wedding dress based on their current and past seasons ready-to-wear silhouettes. Based on these silhouettes, they can then look at fabric options to create a bridal look. Pricing for this service can range from £1,000 up to £6,000. For true custom, you’re then looking at their truly bespoke bridal service which requires a consultation which costs £500. If you then decide to continue, this will be absorbed into the price of your dress. This can take 8-10 weeks and would usually require two fittings. Their bespoke dresses start from about £5,000 and go up to £25,000. Cult London label Galvan is adored for its modern take on evening wear (some which can work as non-bridal bridal) and their slick modern aesthetic. They’ve recently opened a studio in London’s Notting Hill where you can make a bespoke appointment for bridal. Loved by brides and the rest of the wedding party too, Galvan is a super chic option if you’re after a look that’s effortless, simple and clean. Ready-to-wear starts at £1500 and goes up to £5000. Custom bridal is priced depending on your requirements. Their studio is based in Knutsford, Cheshire (outside of Manchester) but they also have an appointment studio in Knightsbridge London. Emma Beaumont is the place to go if you’re a bride who wants to bring lots of design ideas to the table. They offer a really lovely experience where you will work closely with their team throughout the design and development process of creating your dress and come away with something truly made bespoke, just for you. Prices start from £2000, but then, the sky is the limit! They can pretty much do anything, hand-beading included. If there’s a bridal boutique you love which we’ve not included, or you are a bridal boutique and would like to be considered for inclusion, please email us on concierge@whitedossier.com and we’ll be sure to take a look. As we continue to expand, more cities will be added to our Bridal Boutique Directory. No matter what your question, don’t hesitate to email us on concierge@whitedossier.com We’re always happy to help.